Hotel restaurants can often be characterless affairs without any real sense of identity; this is certainly not the case with T55, it oozes class, has a chic, post-modern design and is well thought-out in its conception and delivery. 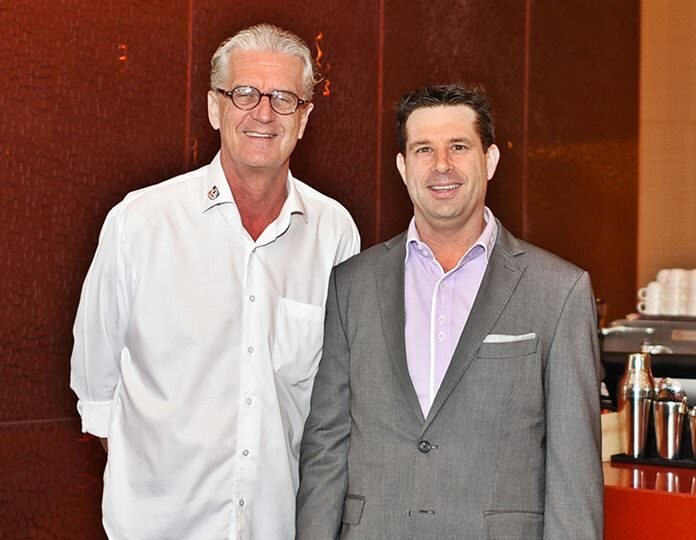 Jo Klemm, Executive Assistant Manager International Marketing Green Orange Media Co., Ltd., with Hayden Edgtton, General Manager of the Mövenpick Siam Hotel Pattaya. The restaurant takes its name from New York’s famed Meatpacking District, and it effortlessly recreates the Big Apple’s hipster vibe without being pretentious. 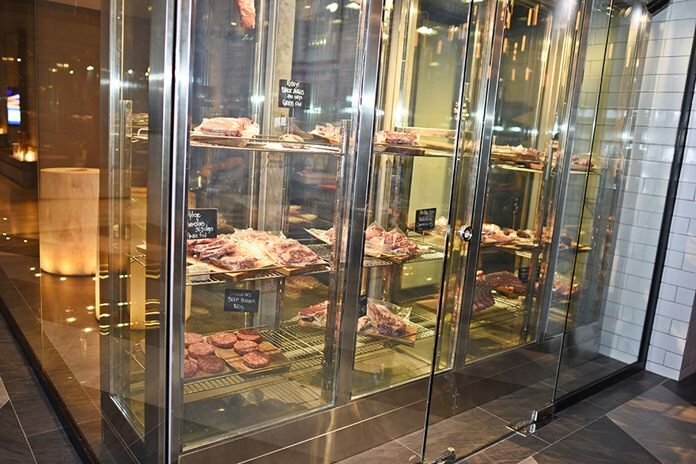 As a homage to the Meatpacking District, aged prime cuts are laid out in glass chill boxes in the Butcher Room for guests to choose and have the chefs prepare. 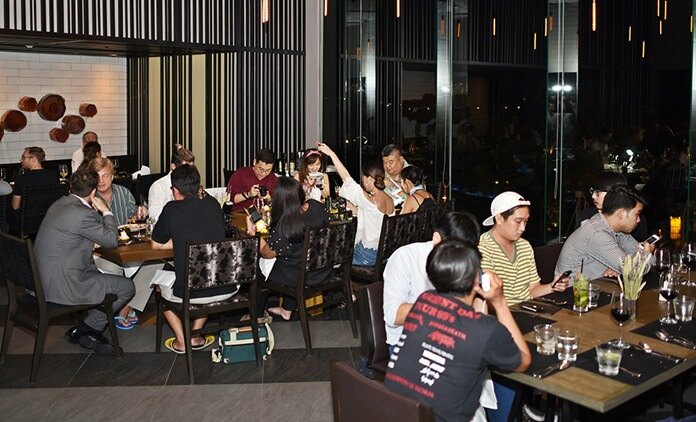 M๖venpick Siam Hotel Pattaya General Manager Hayden Edgtton welcomed his guests and assured them they were in store for something quite different. The unpretentious T55 Grill room is chic and classy. 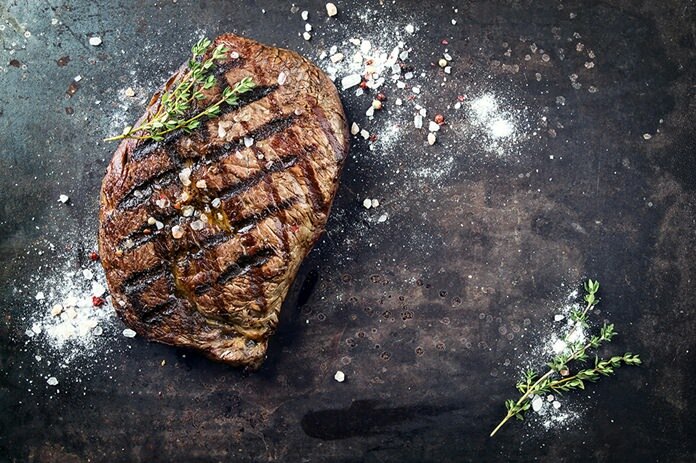 The menu delights even the most serious meat connoisseurs with an array of signature dishes including a succulent Tomahawk steak and the Meatpacking Burger which boasts 250 grams of beef topped with crispy bacon, avocado, beetroot and homemade truffle mayonnaise. An extensive selection of salts and mustards bring out the rich flavours of the meat. The T55 Waldorf salad adds to the taste sensations on offer – a timeless American classic also originating from New York that’s given the restaurant’s own interpretation with sliced apples, walnuts and homemade mayonnaise. The Butcher’s Room keeps the meat at the perfect temperature. Diners can also complement their meal with a selection of fine wines from around the world which are available from the cellar by the glass or by the bottle. To round off a fabulous feast, another signature offering that exemplifies T55 New York Grill Room’s innovative approach and unaffected air is Cookies &Milk – a chocolate chip cookie that’s shaped into an edible cup with warm thick milk poured into it for the perfect sweet memento. T55 is a stylish, spacious and comfortable venue for dinner enhanced by floor to ceiling windows that frame the stunning natural surroundings. The restaurant’s arresting design, enticing flavours and trailblazing culinary concepts bring together urban sophistication and tropical elegance to create a unique prime dining experience. T55 New York Grill Room is set to become a signature restaurant for food lovers here on the Eastern Seaboard. The M๖venpick Siam Hotel Pattaya is situated in Na Jomtien from Pattaya you will see the hotel on your right, do a U-turn pass Ocean Portofino and Dor Shada then M๖venpick Siam Hotel Pattaya is on your left.